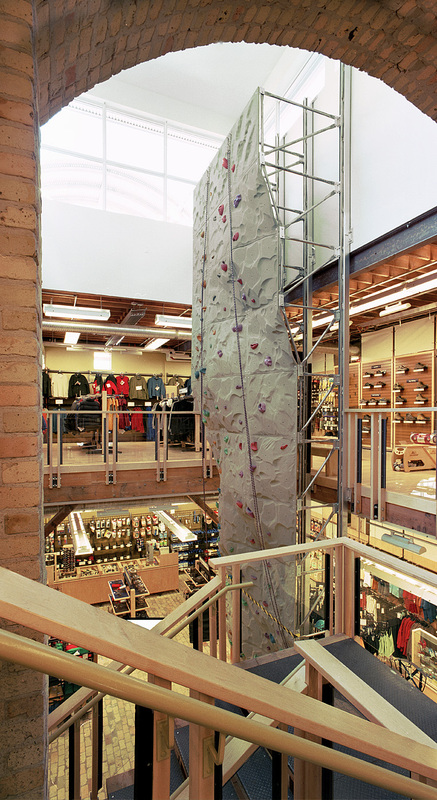 Mountain Equipment Co-op | prairie architects inc. 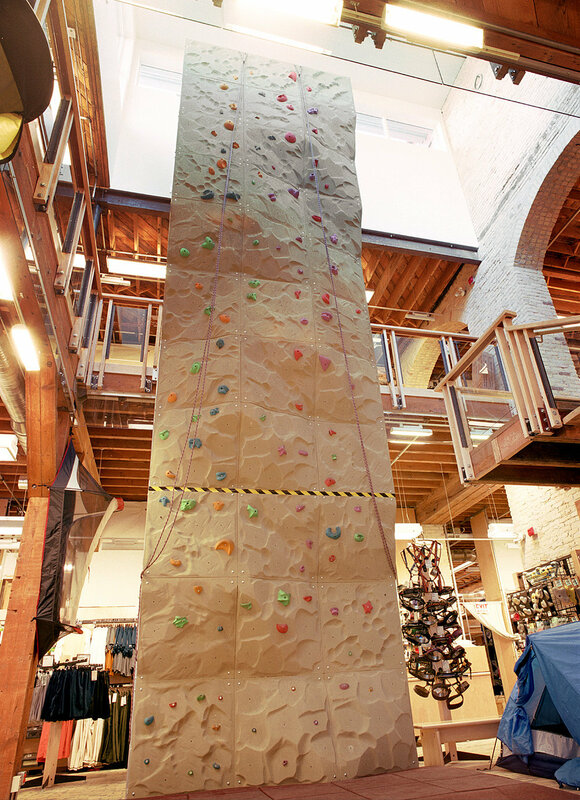 This retail facility for Mountain Equipment Co-op was designed to be one of the greenest commercial buildings in the world and was the first LEED certified building in Manitoba. 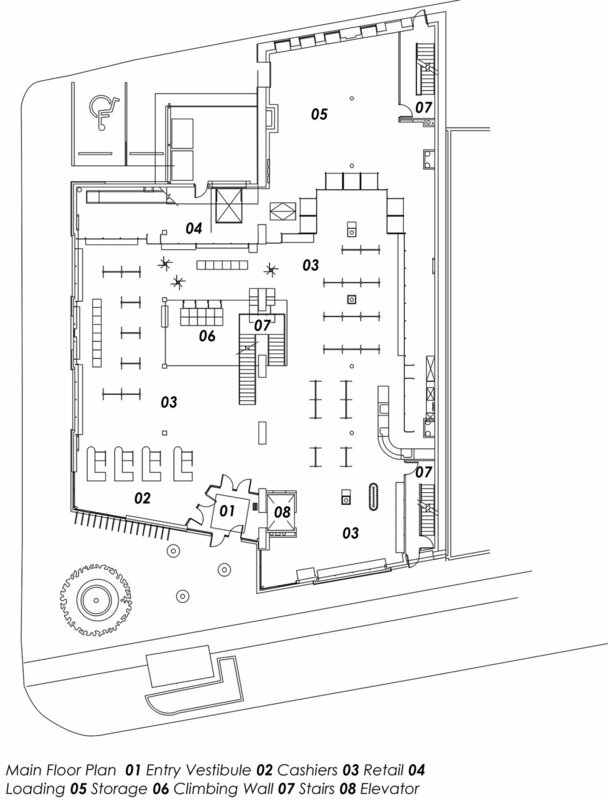 The 30,270sf building incorporates an existing three-storey building to the east of the site with a new two-storey building to the west. The $2.9 million complex opened in June 2002 and was constructed to the C-2000 conservation standards. The building was designed using an Integrated Design Process where all team members worked together in a comprehensive design process to ensure synergetic sustainable design approaches and systems. More than 96% of all materials by weight in the building are constructed from recycled de-constructed materials from existing buildings on site. Rubble limestone and brick from the existing buildings were used for the exterior cladding of the new building as well as the interior floors. The timber and steel from the original buildings form the new structure and framing. New materials are required only for interior finishing and some exterior cladding and include fibre-reinforced concrete panels, fiberglass windows, linoleum floors, isoboard panelling and cellulose insulation. All connections are bolted and screwed to enable future reuse in order that the materials can be recycled again at the end of this life cycle. Irrigation for a green rooftop garden is provided by a PV array that creates electric power to operate a pump that draws irrigation water from basement rainwater collection tanks. Extensive south glazing and a large central roof monitor provide free daylight harvesting into the store. The mechanical systems for the building will include high efficiency gas boilers, energy recovery ventilators, passive cooling valences (no fans), occupancy sensors, in-floor radiant heating and composting toilets. State of the art energy efficient lighting fixtures, occupancy sensors, multiple switching, auto daylight controls, reduced lighting density, all combine for an energy rating that has been certified at 54.5% less than a standard building of similar type built to the Model National Energy Code standards. This will provide annual base year cost savings of $21,500 to the Owner. The construction project also incorporated a number of socially sustainable highlights including hiring workers through House of Opportunity which seeks to find jobs for inner city adults, and recycling bricks from the demolition to contribute to Habitat for Humanity projects. 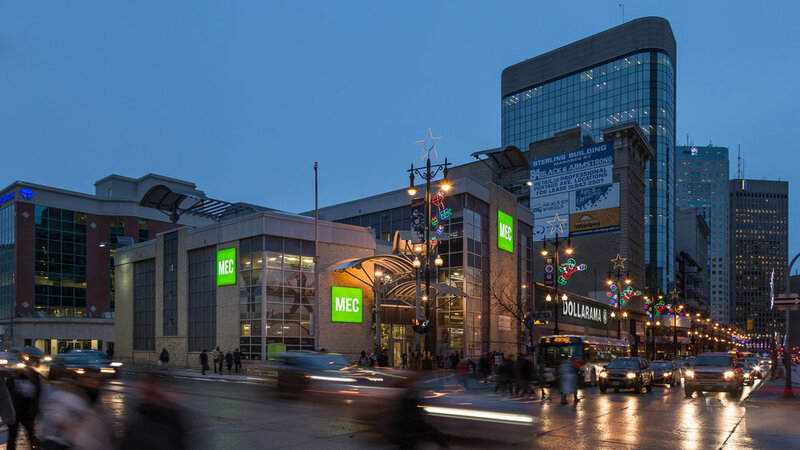 MEC is featured in Public Architecture's publication "Design for Reuse Primer", found here!